After yesterday's rather epic post on the subject of 'When can you claim a recipe as being your own? ', I'm afraid I'm going to have to continue the theme a little longer. After I published the blog, a couple of lovely Twitter pals - Sadia (@bakingelements) and Ros (@bakingaddict) sent me some links to blogs to read on the subject. All this has led me to question if I can claim today's recipe as my own. It started like this. I bought a cauliflower with the intention of making the Cauliflower Mac n Cheese recipe I blogged about in early January. Then I panicked as I realised I'd published the recipe but can't remember for the life of me if I'd typed the method myself or not. I attributed it to the publication, but I recycled the magazine back in January so now I don't know. Oh well, if they have a problem with that, I'll just take it down. Next, I realised I needed to make something new today so it was counter-productive to use that recipe. I love cauliflower cheese and my default recipe was given to me by my grandmother. Make a pint of white sauce using a roux that's 1oz butter to 1oz flour (or 25g each in my world), grate in a load of cheese until it tastes cheesy (depends on the variety of cheese being used as to when you stop), season and add a pinch of cayenne for a kick. Pour over well cooked cauliflower and if there's any spare cheese sauce, just spoon it out of the serving bowl once the cauliflower is gone. Now I'm wondering if she learned that from a book and I'll get chased for copyright or was it handed down from her mother? I can't ask her without hiring an expensive psychic! You can see evidence of this culinary excess alongside my post on Toad in the Hole. With that recipe being very tasty but unhealthy, I thought about trying to make my own from scratch. Without going and reading anyone else's because I figured that most of them would be really unhealthy - if not as unhealthy as my grandma's recipe. So I stood before my fridge with my thinking cap on and started to pull things out. All the thinking was based on past reading on the subject of cheese based dishes, but at no time was this directly attributable to a single source. When Miss A started weaning, I used to make a simple cheese sauce for pasta by melting some Philly with a little milk and stirring pasta into it. I never thought to look on the Philly website to find this advice but now, from a recent ad I saw, this is apparently their method. I also know that lots of cheese sauces recommend using a little Parmesan for the intense flavour and then other cheeses to balance it out. So I selected Double Gloucester - mostly because it was the only other cheese I had in the fridge. When I've used milk to thin the Philly, it's made for quite a runny sauce. So this led to two decisions. Firstly to use Greek yogurt to thin it and secondly to bake the dish which I hoped would keep the excess liquid from a low fat cheese sauce down. I blanched the cauliflower for four minutes in boiling water, just to give it a head start on cooking but without it absorbing too much water. After melting the Philly and yogurt together I grated in a little Parmesan and Double Gloucester, popped in some French mustard and a pinch of paprika, tasted, added black pepper as it was quite a strong cheesy taste already and didn't need any salt and then poured it over the cauli ready to bake. One last touch was the thought of adding a little crispy prosciutto over the top. I was going to dry fry some shredded bits, but then figured that it might work just baking a piece on the side of the tray - thus saving on washing up. And it worked. You may need to adjust the cooking time depending on the depth of the dish you use. I used a two-person pie dish for mine. So here's how I did it. I don't believe that I copied this from anyone so I'm claiming it as my own. Based on MyFitnessPal calculations it comes in at under 330cals for the whole dish. Preheat the oven to 200c/180c fan/Gas 4. Parboil the cauliflower florets for four minutes in a pan of boiling, lightly salted water. In a small saucepan, melt the soft cheese with the yogurt until you have a smooth 'sauce'. Stir in the mustard, Parmesan and half of the Double Gloucester. Season with the Cayenne and black pepper to taste. 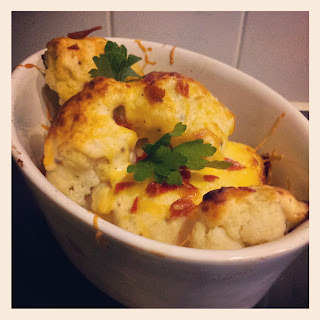 Place the cauliflower in an ovenproof dish then pour the cheese sauce over the top. Sprinkle the top with the remaining Double Gloucester. Place on a baking sheet and put the slice of Prosciutto alongside. Bake for 20 minutes. When cooked, crumble the crisped Prosciutto over the top and then garnish with parsley.